A new Amonix CPV system in New Mexico is packing a big solar power punch, delivering 5 MW to local utility El Paso Electric under a 25-year Power Purchase Agreement. If, as a child, you used a magnifying glass to burn wood or light a cotton string on fire, then you've played around with the basic theory behind Amonix Inc.'s concentrated photovoltaic systems. The Amonix systems are much more high tech, however, and rely on a Fresnel lens to concentrate the sunlight on cells comprising three different materials. This allows them to capture more energy from the same light wavelengths compared with traditional PV systems, says Carla Pihowich, Amonix vice-president. 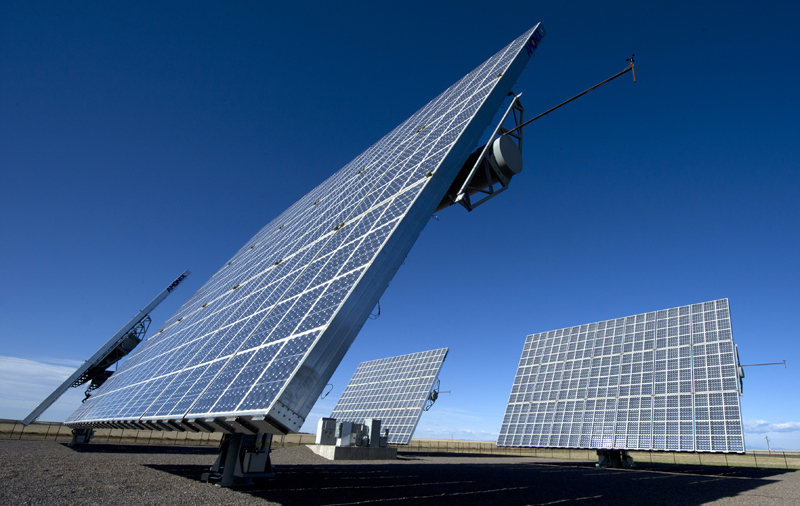 By mounting the panels on dual-axis trackers, Amonix systems have a smaller footprint than traditional PV systems but with greater electricity output, she says. "CPV (concentrated photovoltaic) is not only competitive today but will widen the gap and be even more competitive than alternative PV technologies going forward by 2020," Pihowich says. The Seal Beach, California-based company boasts the largest CPV project to date in North America, located in Hatch, a town in south-central New Mexico famous for its chili peppers. Altogether, Amonix is responsible for 52 of 62 MW of CPV production globally, she says. The 5 MW Hatch project, which was fully commissioned in June 2011, is owned and operated by NextEra Energy Resources LLC, a subsidiary of NextEra Energy Inc. based in Juno Beach, Florida. The firm sells the electricity—enough for about 1,300 residences—to El Paso Electric under a 25-year Power Purchase Agreement. The Hatch project was constructed on 39 acres in the Hatch Industrial Park, about seven miles west of the village of Hatch. The village funded the project through the sale of Hatch Industrial Revenue Bonds. NextEra Energy Resources leased the ground for 99 years from the village. Although the company obtains the bulk of its renewable energy from wind generation, Steve Stengel, a spokesman for NextEra Energy Resources, says the firm is "technology neutral." "The Amonix concentrated photovoltaic (CPV) solar power systems are a good fit for our site in Hatch, N.M., because their technology performs very well in high-sun, low-humidity climates," Stengel said. "They have a high energy density and are designed to operate in utility-scale applications." The Hatch project involves 84 60 kW Amonix systems that were manufactured at its new state-of-the-art production plant in North Las Vegas. The North Las Vegas location was no accident, either, Pihowich says. Amonix chose it so production would be strategically located near its target market of the desert Southwest. Each 22-meter-by-15-meter system is about the size of an IMAX movie screen and consists of 7,560 high-efficiency multijunction gallium indium PV cells. The multi-junction cells achieve much higher production rates by using different materials than the traditional silicon cell. They also combine multiple semiconductors within a single package. Multiple layers of cell material are deposited onto a gallium substrate. Each layer is designed to optimize conversion of specific wavelengths of sunlight. The subcells are connected serially, so what light the first material doesn't use is passed along to the second. The cells are also covered with a Fresnel lens that concentrates the amount of sun hitting the cells by up to 500 times. This enables them to produce a significant increase in voltage, while losing less energy to heat. As a result, they provide the solar industry's highest efficiencies, Pihowich says. The cells can exceed 39 percent in volume production in the field compared with 12 percent for thin film PV and 22 percent for high-efficiency silicon-based PV cells, she says. These multi-junction cells have proven their ruggedness in space, having been used on the Mars Rover and Spacelab, to name a few projects, Pihowich says. Since the Amonix Inc. MegaModules are erected on pedestals, the systems have minimal impact on the environment. When stowed horizontally during windy periods, each MegaModule sits nearly 28 feet off the ground. Secondary optics are added to create individual modules, which are then integrated into MegaModules. Seven MegaModules are joined together to create each Amonix CPV system. The factory-fabricated subsystems are designed for easy installation and field adjustability, she says. In conjunction with its Mega-Modules, Amonix uses a proprietary computer-controlled dual-axis tracking system that follows the sun throughout the sky, much like a sunflower, Pihowich says. 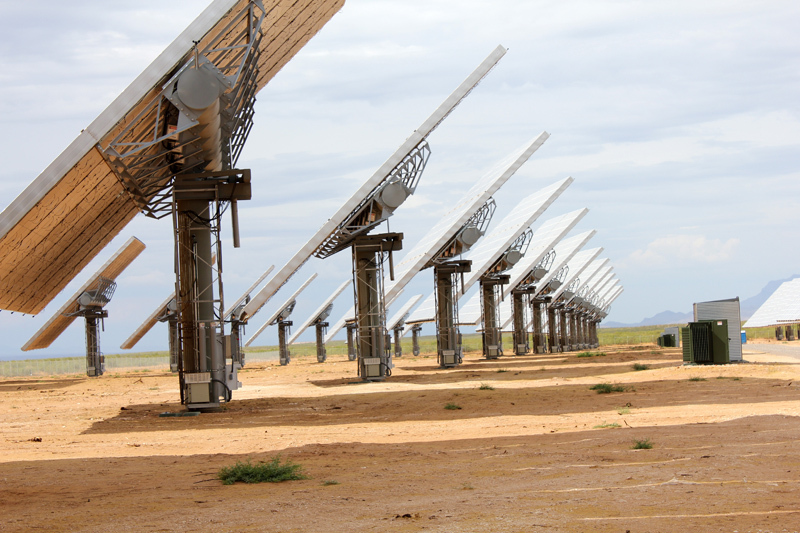 CPV performs best in areas that are sunny and have a high DNI—or direct normal irradiance—a measure of the solar resource available to concentrating solar collectors that track the sun throughout the day. In addition, CPV solar farms themselves take up much less space per kilowatt generated than conventional PV solar farms. "We use land more efficiently than other technologies, producing about 1 MW on 4 acres," Pihowich says. Because the MegaModules are erected on pedestals, the systems have minimal impact on the environment, she says. When stowed horizontally during windy periods, each MegaModule sits nearly 28 feet off the ground. As a result, the land below can be used for other purposes, such as grazing livestock. CPV also is well-suited to deserts because it doesn't require any water for power production. "That's very important where water is very precious," Pihowich says. "And there's water scarcity in our target market." The only water that's used is to wash the modules about three to four times per year. Blattner Energy, based in Avon, Minnesota, was selected as the engineering, procurement and construction, or EPC, contractor for the Hatch project because of the firm's long-standing relationship with NextEra and its experience installing large-scale wind farms. Before starting a project, Blattner applies its own version of the LEAN process to determine the most efficient steps to follow. The Hatch project was no exception, says Aaron Pyfferoen, Hatch project manager for Blattner. "Before construction, we determined the best way, right crew size, and most efficient way to build this out," he says. Finding experienced laborers in the rather remote Hatch area wasn't a problem because Blattner Energy's sister firm, D.H. Blattner& Sons, has historically been involved in railroad work. They were able to draw from the pool of laborers who work on the Sunset rail corridor that passes through the region. "We brought in people from all over the country," Pyfferoen says. "A lot of people were from Hatch and Deming. We had the advantage that some of the supervisors lived only 30 minutes away. We had craft workers who had families and were happy because they could go home to them at night." The CPV systems from Amonix Inc. use a Fresnel lens to concentrate the sunlight on cells comprising three different materials. This allows them to capture more energy from the same light wavelengths compared with traditional PV systems. At the project's peak, Blattner had about 60 workers on site. The actual construction began in late January 2011 with site preparation. Installation involved boring holes, then sinking the 3-foot-diameter steel pedestals 21 feet deep. "We brought in a pretty good sized drilling rig," Pyfferoen says of the machine that's also used to install poles carrying transmission lines. As part of the installation, the pedestals were encased in concrete. Drive heads that control the angle of each panel were added atop the pedestals as were service cages. Then the MegaModules were hoisted in place using cranes. The repetitive nature of the actual module installation is much like turbine installation on a wind farm as are the technical aspects of the installation, Pyfferoen says. Once the pedestal work was complete, workers could install about a half MW per day. Pyfferoen says the crews encountered few challenges along the way except for some winter snow. During the first week of February, a 2-inch snow stopped work on the project for a couple of days. "It shut the area down,"
Pyfferoen says of southern New Mexico. "It was a crisis for the whole community." It was different to see coming from Minnesota where a few inches of snow would have little to no effect, added Pyfferoen. Because the project was only 5MW, he says, they were able to tie in to the local distribution lines and didn't need to modify them." "El Paso was able to off-take it without line upgrades," he says.